A man poured hot oil over his ex-girlfriend’s head because she allegedly cheated on him, he told the High Court today. Ioan Felician Gyorfi claimed he was provoked into emptying the contents of a deep fat fryer around the victim after she had cooked him egg and chips. A judge shown pictures of the burns inflicted said the woman could have been blinded in the attack at a house in Portadown, Co Armagh on July 7. Gyorfi, a 35-year-old Romanian national, faces a charge of causing grievous bodily harm with intent. Bail was refused amid fears he could flee or re-offend. Gyorfi, of no fixed address, started seeing the woman after he moved to Northern Ireland just over a year ago. 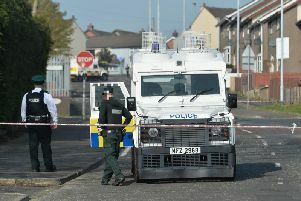 The attack was allegedly carried out when he went back to the house to collect his belongings following their break-up. Philip Henry, prosecuting, said the woman offered to cook for Gyorfi after he complained of having eaten nothing for days. “He asked specifically for soup, she said she didn’t have any but she made some egg and chips for the two of them,” the barrister said. Mr Henry described it as “a quite horrific incident”. The woman suffered burns to her face, neck and the palms of her hands. Gyorfi admitted carrying out the attack, the court heard, telling police his original plan was to throw soup round the woman. During the hearing the accused, appearing via prison video-link, repeatedly claimed the woman had cheated on him. He described her as a “good and kind woman” but said he had been provoked. Defence counsel Barry Gibson questioned whether his client’s alleged actions involved any intent. “He explained that this was not planned, it was spontaneous,” Mr Gibson added. Denying bail, Mr Justice Burgess insisted Gyorfi’s unfounded accusations against his ex-partner were no excuse. He said: “Even if it were half true would be no reason whatsoever for the actions that he took.